The industry’s move was effective, inasmuch as it forced Wheeler to retreat from his original proposal, and come up with a new plan loosely modeled on the industry’s app-based approach. While Google said it could live with the new proposal, the industry still found much not to like, and an all-out lobby blitz again forced Wheeler to postpone a planned vote on the measure. But Google has been nothing if not persistent in its long effort to muscle its way into the TV business and its mother lode of advertising dollars, dating back to the ill-fated Google TV, and it’s now back with a new strategy. And once again, whether intentionally or not, it is getting an assist from the FCC. Instead of trying to get inside the set-top box, Google’s new effort involves bypassing pay-TV operators altogether and negotiating carriage deals directly with the networks for a new, web-based TV service it is building on the YouTube platform, according to a report by the Wall Street Journal, with eye toward an early-2017 launch. CBS is the first major media company to sign onto the new service, which will be called Unplugged, according to the Journal, while negotiations are underway with 21st Century Fox, NBCUniversal, and Disney. Google is looking to offer a skinny bundle of live channels for $25 – $40 a month, media execs told the Journal. The direct approach would remove one of the major objections the media companies had to Wheeler’s earlier proposals: fear that giving third-party device makers access to pay-TV content would supersede rights owners’ painstakingly negotiated carriage deals with pay-TV operators. By seeking licenses itself Google is allowing the networks the leverage to negotiate the terms of carriage directly, including provisions covering how their channels are presented and what Google can do with respect to advertising and with the content itself. Google’s effort comes amid a rising tide of similar over-the-top efforts. AT&T is looking to launch its DirecTV Now service by the end of the year, while Hulu is planning to launch a multichannel live video service in 2017. Dish is already in the market with Sling TV, while Verizon launched its Go90 video service earlier this year. None of those efforts are the direct result of any action by the FCC. But Wheeler has made no secret of his desire to dislodge the incumbent cable providers from their privileged position in the the home, both in video and in broadband service. And as I noted in a previous post, by his inaction Wheeler has given some of the most likely competitors time and space to develop their video and broadband services. 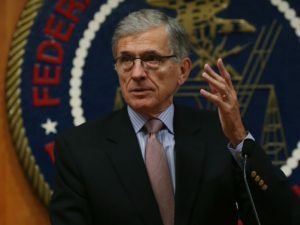 Wheeler exempted wireless carriers from key provisions of the FCC’s net neutrality order and he has winked at their zero-rated video offerings as he waits for 5G wireless broadband technology to become a viable competitor to in-home, fixed-line internet access. While his set-top box proposals have been blocked the ongoing proceeding has kept the industry on the defensive for more than a year. Now, Wheeler appears to be deliberating keeping the latest version of his proposal under wraps, frustrating participants on all sides of the debate, leaving the fate of the traditional set-top box hanging and keeping the industry in a kind of suspended animation, unsure where to invest or how to respond. Meanwhile, Google, Hulu and the others are getting the pieces in place to launch their competitive services while aiming at a stationary target. It may not be strictly kosher on Wheeler’s part, but it has been effective.